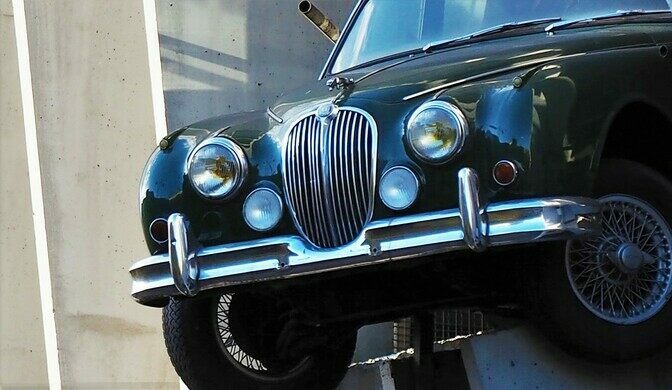 An early 1960s-era Mark 2, in British racing green, hangs precipitously over Cours Victor Hugo in central Bordeaux. 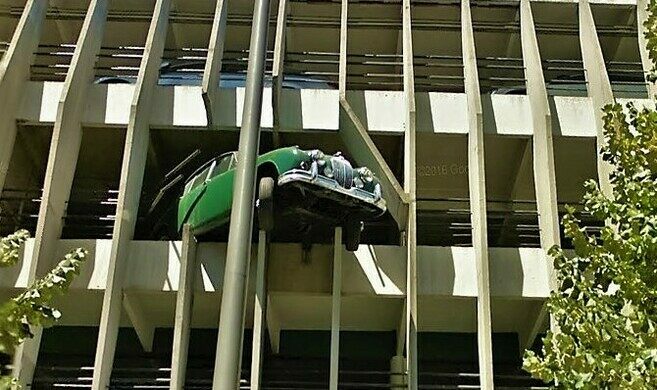 Luckily, no Jaguars were harmed in the making of this parking lot. 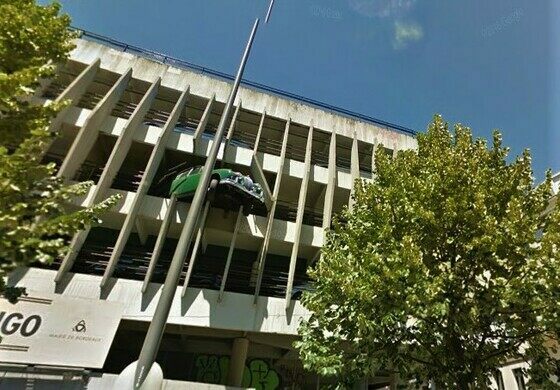 The garage serves Marché Victor Hugo (the local farmers market) and nearby sports arena, and was built in the 1960s by architects Jean Dauriac and Pierre Laffitte (who also built the arena). 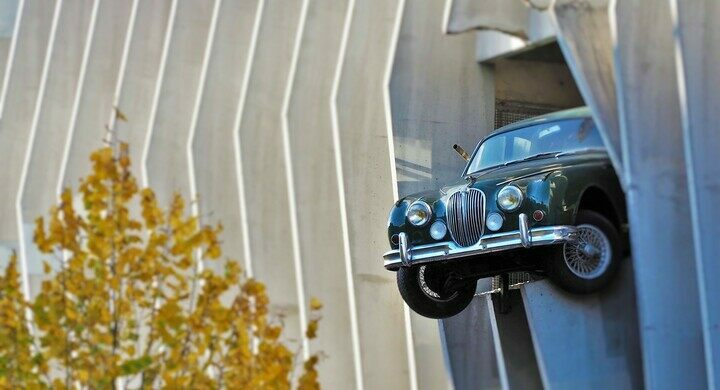 When the structure went under renovations in the early 1990s, designer, artist and architect Jean-François Dosso added the Jaguar, originally thought to be only a temporary public art installation. But the vintage beauty has stuck around, dangling its bonnet out over the street. It’s a piece of clever trompe d’oeil, announcing the building’s purpose pretty clearly, but it also adds a touch of literal off-the-wall whimsy to an otherwise perfectly functional, if starkly unadorned, modernist building. 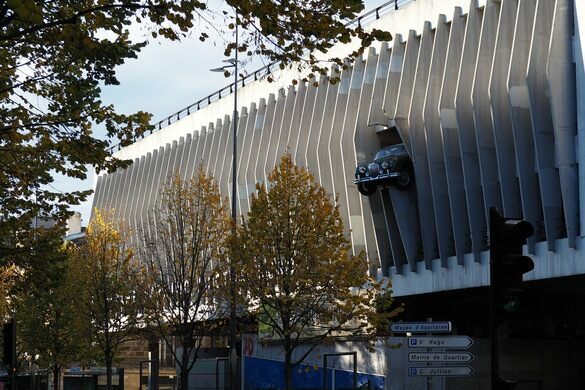 The structure is in central Bordeaux, and is the parking lot for the Victor Hugo Market and Sports Center. 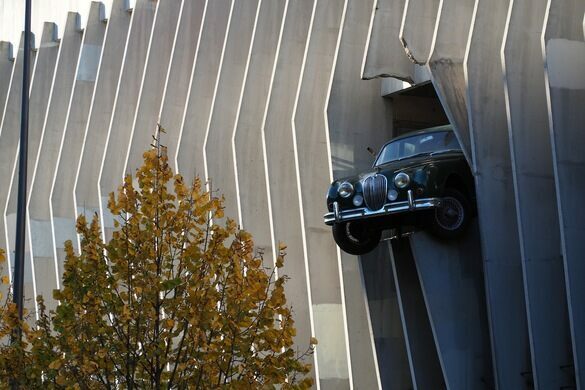 You can park there 24/7, or just look up and see the Jaguar.